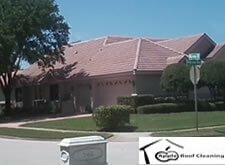 You will not find a more professional roof cleaning service in the Palm Harbor area, guaranteed. It can be dangerous to believe (and actually act on the belief) that you can carry out your own roof cleaning service. Stay safe and put the project in the hands of a professional that has been completing similar projects for years and years. What’s more, you won’t have to spend a large amount of money to hire me. Apple Roof Cleaning receives referrals weekly for cleaning services in the Palm Harbor area this is no accident. Once you hire me, you will never think about hiring another Roof cleaner. You may even be compelled to share the experience with a friend or extended family member (hence the referrals). So, what makes the experience with Apple Roof Cleaning Of Pasco & Pinellas so special, anyway? I am a consummate professional in the sense that I never show up late and treat your home like it’s my own.